Gardens are another dimension through which to explore history, similar to politics, literature, the arts, technology. The following quick guide to garden history puts some the key garden styles into the context of the time periods when they were most developed. Click on the photos or links to learn more about the different garden styles. The earliest recorded Western gardens belonged to the Egyptians and Persians, and the earliest Eastern ones to the Chinese. Chinese gardens were idealized representations of nature that provided space for contemplation, art, and poetry. Chinese gardens were recorded extensively in drawings and gardening books; and garden design remained a respected art form for thousands of years in China. Further west, the gardens of Egypt and Persia were about paradise. Roman gardens reflected the influence of traveling to across the middle east and combined the ideal of paradise with Greek geometry. 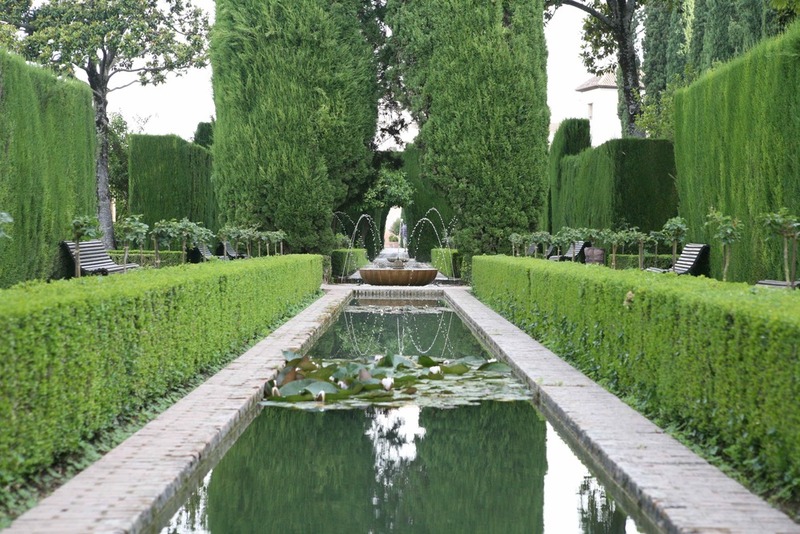 In Roman gardens we see rectangular pools set on an axis that align with key building elements. 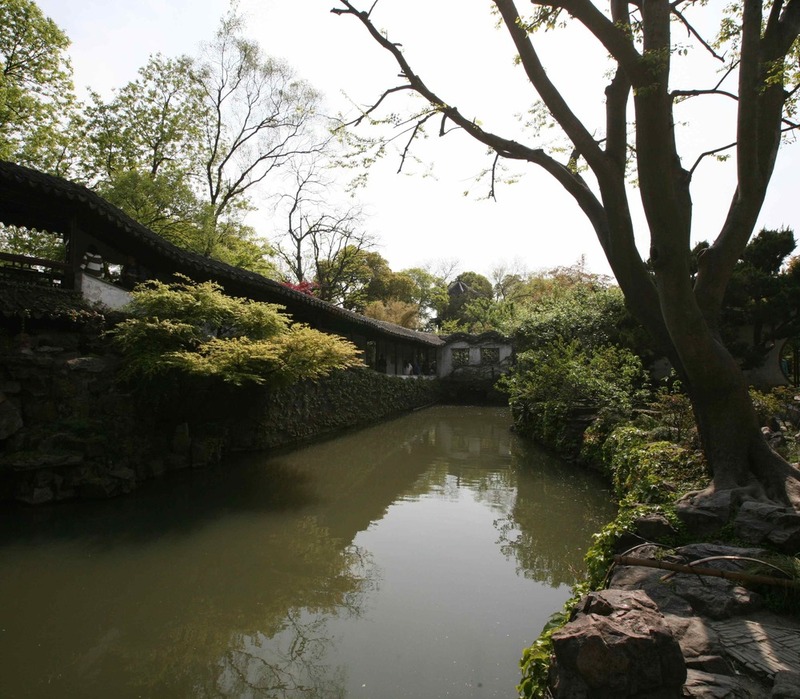 The East Asians continued to refine garden design with beautiful scholar gardens and landscape parks that incorporated the principles of Feng Shui. Chinese design ideas moved north and were incorporated into the Korean and Japanese garden. This included the development of rock gardens and water features. Meanwhile, Europeans were living in a divided and uncertain world, with power collecting in the church. Gardens in Europe centered around the monastery based cloister garden. A beautiful space sheltered from the outside, divided into geometric plots and planted with useful plants for food and medicine, or to decorate the altar. By the end of the middle ages, we see the height of the Islamic garden. Luxurious plantings, fruit trees, and simple water elements featured in these elegant gardens. The influence of the Koran include the absence of human figures and water features laid out in quadrants that reference to the 4 rivers of Eden. Mathematics and geometry represented a pure and balanced world. The East Asians continued to refine their garden design in line with the Taoist, Confucius and Buddhist teachings. While maintaining the principle of idealized nature, we started to see the use of clipped trees in the Japanese garden. In the mid 1500’s, the Italian Renaissance garden brought back the sculpture and geometry of the Romans (who borrowed it from the Greeks, Egyptians, and Persians). In the 1600-early 1700’s, the geometric Italian style became even more formal in northern Europe where plant material was clipped into living sculpture called the French formal garden. With sustained peace, prosperity, and rise of a middle class, the design of pleasure gardens became a real pastime. Garden design gurus were divided as to whether a garden should be formal (in the French style) or informal (in the English style). But the biggest development came from the invention of the Wardian Case – a glass box that allowed plants to survive during long journey’s at sea. That case, coupled with regular transoceanic travel meant the rise of the plant hunter. Like birds who carry plant seeds along their migratory routes, people began to carry plants across lands where they had never been seen. Thanks to this the West is able to enjoy the rhodedendrun, hydrangea,… The desire to show off these new additions gave birth to the gardenesque movement. So popular in England which became ground zero for all things gardening related, it caused another movement to blossom in reaction to it which was the wild garden. The arts and crafts movement was a backlash to the industrial revolution. A return to handmade, respected artisanship,… also extended to the garden. The arts and crafts garden combines architecturally integrated, geometric extension of the house, the extensive use of garden rooms, and exuberant, lush plantings. The most lasting legacy of this movement has been the popular herbaceous border which I think of as an entire meadow of flowers condensed into a strip a few feet wide. The result is spectacular. After World War I, artists shifted from looking to the past for inspiration to looking to the future; design, technology and machines would solve the problems of the world. Accessibility and functionality were primary; modernist garden design moved to geometry and formality, but without the symmetry of the formal French or Italian gardens. Entire squares filled with one specimen: tidy, easy to care for, and in harmony with the architecture of the home. With global travel and the migration of peoples beyond their ancestral homes, garden ideas have been exchanged and moved all over the world. As a result, “French” gardens can be found in Brazil, “English” gardens in Italy, “Italian” gardens in Florida, “Japanese” gardens in Maine, and so on. With Japan opening to the West in the 1850’s, books like Reginald Farrer’s 1904 The Garden of Asia inspired gardeners to create in that style. In that same year, Jo Sakai organized a group of Japanese farmers to create an innovative farm in south Florida. This set the seed for what would become Morikami, an amazing Japanese garden there. Science and pop culture also played a role in the interest in garden styles. Although the Wild Garden was first talked about in the 1850’s, one hundred years later Rachel Carson’s Silent Spring (1962) gave the natural garden a huge boost. Her book sold 1 million copies in it’s first 2 years alone, led to the banning of the toxic chemical DDT. I believe that she set the see for the Prairie style so popular today. Historic gardens remain wonderful places to enjoy the wonders of nature and key elements of these styles continue to be re-invented and remain relevant today. ©2018 The Good Garden. All rights reserved.